Oilfield Physical Infrastructure Security is an increasing concern. For example actions taken during the theft of copper wire on a oil and gas facility can cause significant losses much beyond the value of the materials. Acts of Vandalism, and theft, or terrorism on equipment in lay-down and storage yards and cause the same problems. Damage during theft of drilling rig equipment might require lengthy and expensive repairs before equipment can be deployed on site. This can cause contract and schedule problems. Terrorism and targeted malicious actions are designed to cause significant economic, environmental, or political damages. Off the shelf commercial alarm systems are not fully suited for oil and gas security monitoring. The nature of oil and gas industry operating in remote areas and spanning large areas make security systems a challenge. There is no ready access to power at sites. Due to the large expanse of oil and gas infrastructure wiring to remotes sites is typically not feasible. At many sites there is no telco lines available for connecting alarm systems. The fast paced operation of oilfield makes a need for security solutions that allow for rapid deployment. Despite the challenges, commercial alarm systems and video surveillance have been used for oilfield security. More recently moibile camera trailers have been seen increasing use. 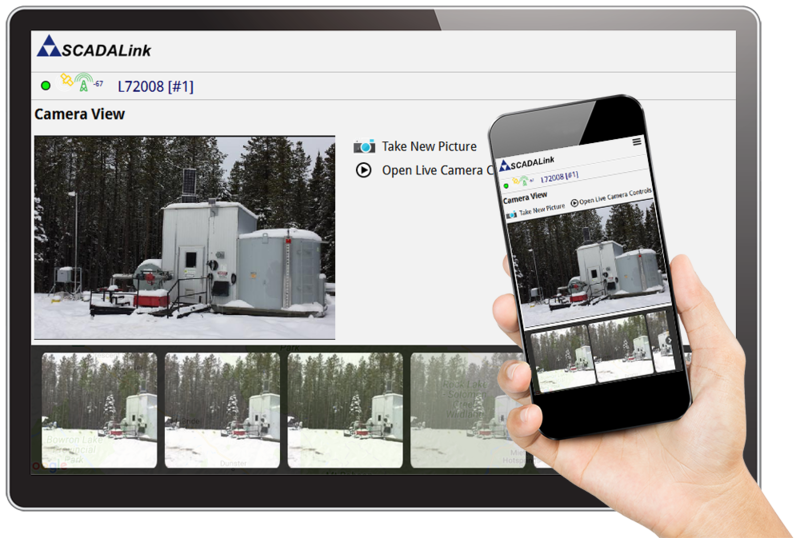 SCADALink FieldSecure is a Industrial Security Solution designed for rapid deployment. For industrial applications such as oil and gas where there is need to monitor large areas with difficult to provide wiring for power, and connectivity. 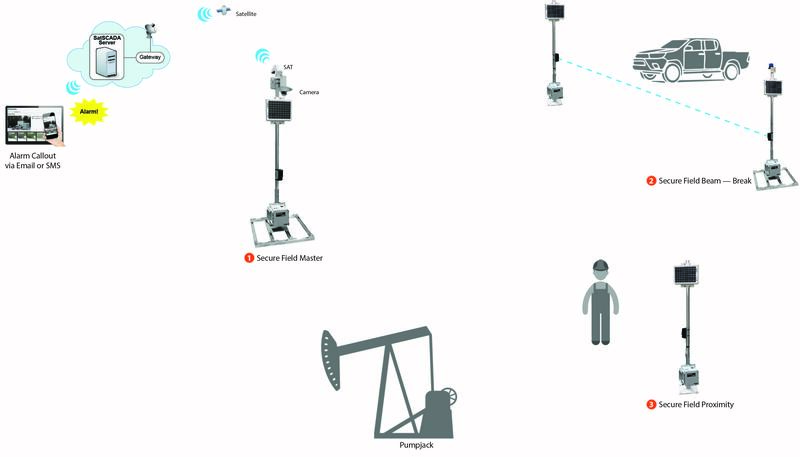 A typical FieldSecure system may consist of multiple Remote N0odes and a single Camera node at the well site. Field Secure Remote Sensor Nodes are solar powered are designed for plug and play operation including all mounting hardware. Sensor nodes include an array of security sensors designed for long distance monitoring. Each Remote Sensors Nodes can include beacon. 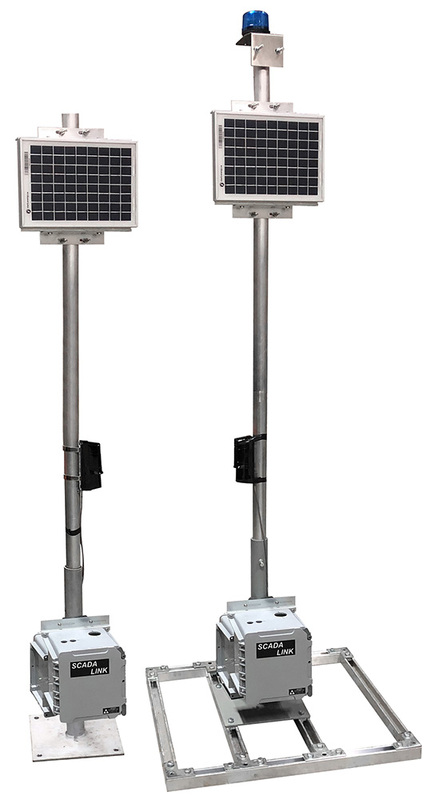 Remote Sensor Nodes are solar powered are designed for plug and play operation including all mounting hardware. Sensor nodes include an array of security sensors designed for long distance monitoring. Each Remote Sensors Nodes can include beacon. Many of the Field Nodes are designed for intrusion detection for large areas such as oil field sites and equipment yards. The following picture shows a Beam Break Sensor Node that can be used on a site roadway entrance. tions are designed for intrusion detection for large areas such as oil field sites and equipment yards. The Master Node can be Solar or Line Powered. The purpose for the master node is to control site alarms, and provide remote alarm notification to alert the appropriate operation and security personnel locally and remotely. An optimal Dual Mode Sat/Cell Gateway allows the Master Node to connect the SatSCADA Cloud host which performs alarm notification and monitoring. The Master Node has Modbus Protocol and can enable the customer to connect to the FieldSecure Network from their SCADA System. The MasterNode may typically be located central to the facility and have a video camera attached. Field Secure uses the SatSCADA Cloud Host Platform to allows users to monitor the status/history of alarms via web browser on desktops, laptop, tablets or smartphones. With the SatSCADA Cloud Host, Security Monitoring can be easily integrated with Field Operations Monitoring. The SAT130 Dual Mode Satellite/Cellular Modem IoT Gateway can be used for remote connectivity to IP Cameras for Remote Site Video Surveillance & Monitoring Applications.